Science teachers across the country are constantly looking for new ways to develop lessons and experiments that will engage their students while also aligning with state-adopted education standards such as Common Core and Next Generation Science Standards (NGSS). By creating new interactive Community Science Events for local science teachers, and with funding from the Pasadena Educational Foundation (PEF), the Center for Teaching, Learning, and Outreach (CTLO) is encouraging these educators to use cutting-edge laboratory research at Caltech as inspiration to make their K-12 lessons in STEM fields more creative. The adoption of new state educational standards can translate into big changes in the classroom. The Community Science Events encourage teachers to implement these standards with lessons and activities connected to contemporary research topics, says Julius Su (BS '98, BS '99, PhD '07), CTLO program manager and event co-organizer. The events, collaborations between Caltech, the PEF and the Pasadena Unified School District (PUSD), begin with a public lecture by a Caltech faculty member, who presents an aspect of his or her research with popular science appeal. The first event, held at Caltech on March 2, featured a lecture by Professor of Physics Ken Libbrecht, who discussed his research on the atmospheric conditions that determine how and why snowflakes form the shapes that they do. Afterward, volunteers provide lab demonstrations related to the presentation that can help the teachers translate the researcher's science into practical K-12 learning activities for the classroom. 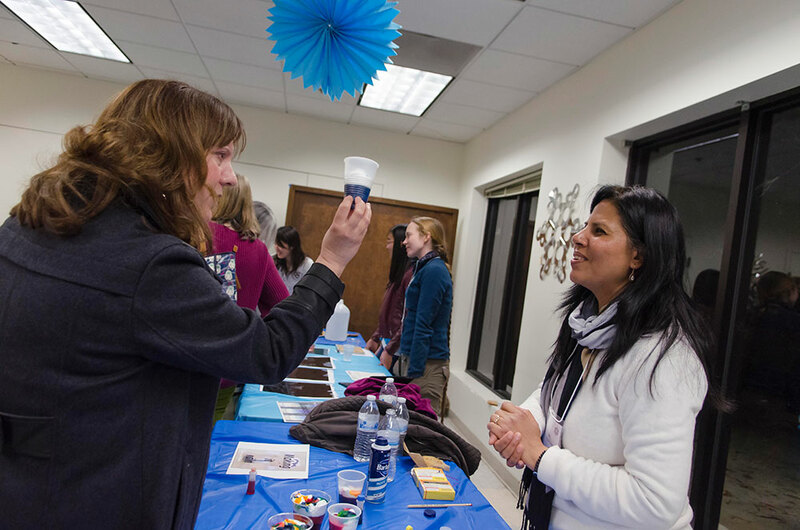 At the snowflake event, volunteers demonstrated how to make snowflakes using everyday items such as Styrofoam cups, soda bottles, and fishing line; how to fold snowflake origami; and how to build a cloud chamber for visualizing radioactive decay. 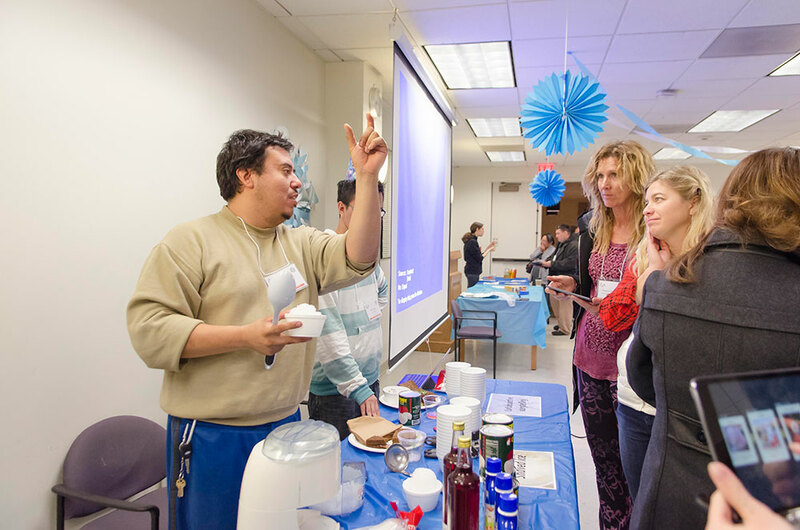 Samuel Garcia Jr (Pasadena City College) and Minh Pham (University of California, Riverside) make shaved ice and discuss light scattering with teachers. In back, Caltech graduate student Kelsey Boyle talks about the growth of sugar crystals. More than 90 K-12 teachers from 35 schools in Pasadena and the surrounding area, along with 37 volunteers from Caltech, Pasadena City College, the Armory Center for the Arts, and other institutions, attended the inaugural Community Science Event. At the event, teachers have opportunities to interact, asking the faculty member and volunteers questions about the featured topic. The teachers then discuss their students' needs and available resources before breaking into teams to create grade-appropriate lessons. CTLO program manager and event co-organizer James Maloney (MS '06), who has been organizing outreach activities at Caltech for more than 10 years observed the importance of teachers at all different grade levels being part of the event. "We can take the core ideas from the event, find the common thread, and branch out grade-specific lesson plans," Maloney says. "The teachers are literally creating this big interlinked knowledge base right then and there." 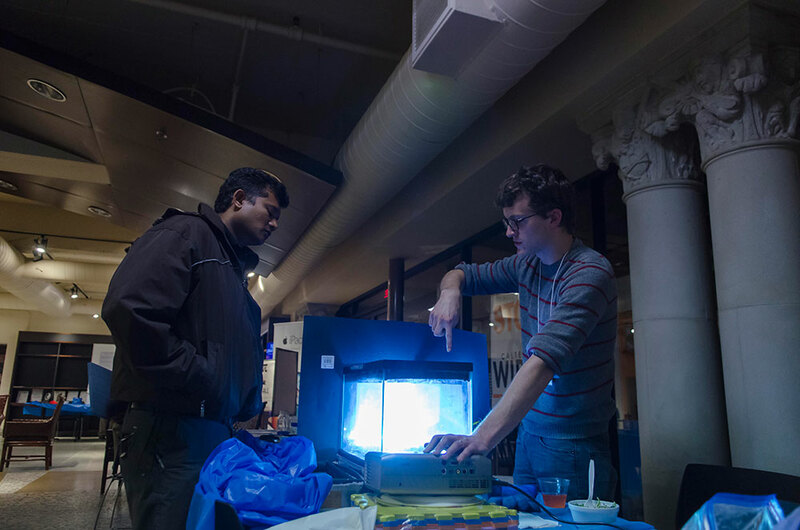 Caltech graduate student Dan Thomas shows Ravi Dev Anandhan (Sierra Madre Middle School) a cloud chamber he built to visualize radioactive decay. Su says this process of creating lessons falls within the recommendations of Common Core—a widely adopted set of standards for mathematics and language arts education in the U.S. "The Common Core places emphasis on 'the four Cs': communication, collaboration, critical thinking, and creativity. We've incorporated elements of all of those. We're bringing all of these teachers together to work on lessons, make interlinked content, and approach learning in a collaborative way using our technologies, activities, and resources," he says. Because the Common Core also emphasizes the integration of science and math with the humanities and the arts, the Community Science Events will include visiting partners from the Huntington Library and the Armory Center for the Arts to add additional historical and cultural context for the presented science and to provide ideas for related activities. Future events are still in the planning stages, but Su and Maloney hope to cover a variety of topics within earth and space science, life science, and physical science in 12 events over the next two years. The eventual goal is to use each event to touch on one of the 11 key areas outlined by the Next Generation Science Standards, which were developed by a consortium of 26 states, the National Science Teachers Association, the American Association for the Advancement of Science, and the National Research Council. The standards also focus on lessons that are relevant to real-world problems, and the event has a similar emphasis. "Caltech professors will be presenting results from their actual research, and volunteers will do related demonstrations that address real-world problems. Also, because the activities incorporate a lot of do-it-yourself technology, they emphasize the linkage between science and engineering," Su says. Rita Exposito (Principal, Jackson Elementary School) talks with Alka Kumar (Arcadia Children's Education Center) about how water vapor in clouds condenses into rain droplets. In addition to helping teachers adapt to the new standards, the interactive ideas presented at the Community Science Events will also spur ideas for fun and creative new classroom content—a benefit that both teachers and students appreciate. "It felt so fantastic to develop lessons for my classroom that authentically mimicked the way 'real scientists' worked, doing research," says Suzanne York, a teacher at Sierra Madre Elementary School who attended the event. The events allow "students the opportunity for some real scientific content, while I worked on more of the pedagogical end," she says. The events also "allow teachers in PUSD to work with Caltech scientists and see the various new technologies that are being developed," says science teacher Seung Seo from Marshall Fundamental High School. "This kind of collaboration is very important to the future of science education, especially for public schools with limited funds," she adds. "The new Common Core and NGSS standards can often mean big changes—and sometimes challenges—for teachers. Events such as ours provide a way to put all these revisions in the hands of the teachers while also allowing them to take advantage of community resources around them," Su says. Professor Ken Libbrecht delivers a presentation on his snowflake research to an audience of local teachers at the inaugural Community Science Event.